As many of you know, Reem’s bakery at the Fruitvale BART Station in Oakland, California – the very spot where Oscar Grant was famously shot dead by police in the early hours of New Year’s Day, 2009, touching off local riots – continues to display a mural of Rasmea Odeh, one of the murderers of college students Edward Joffe and Leon Kanner in Jerusalem in 1969. On Sunday, January 28, 2018 – perhaps as you read this – a few pro-Israel / pro-Jewish people will stand outside of this anti-Israel / anti-Jewish politicized bakery that all Jewish people must pass by if we wish to get onto the Bay Area Rapid Transit system (BART) on our way into San Francisco or anywhere around the Bay Area. Whenever I pass through those turnstiles, which is fairly often, it puts my mind to nothing so much as 1930s Berlin. Can you imagine what it is like for any Jewish person in the SF Bay Area to have to walk past a restaurant that publicly celebrates the murder of your own people if you simply wish to take public transportation? And what is even worse is that, in this part of the political universe, if you so much as dare to object you are smeared as a racist and an Islamophobe and a sexist and a transphobe and God Knows What All. ACTION: Please come and join our vigil against this book signing. 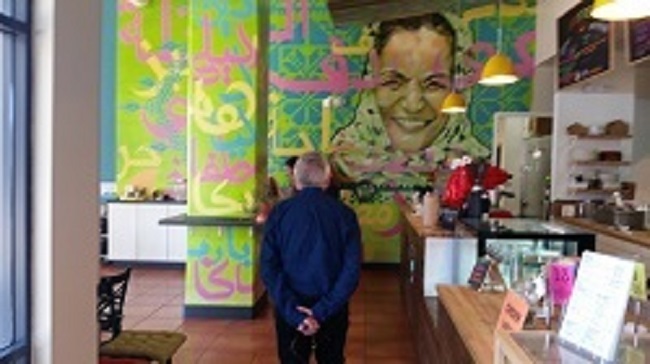 In one of the most egregious examples in recent memory of the normalization of anti-Semitism and violence in our community, Reem Assil has decorated her Oakland bakery with a floor to ceiling mural honoring convicted terrorist Rasmea Odeh, who murdered 2 and wounded 9 others when a bomb she placed in a Jerusalem grocery store exploded. On Sunday January 28, the bakery will be hosting a book signing promoting academic boycotts against Israel. 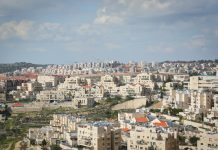 In response, there will be a vigil in front of the bakery, exposing the hate and intolerance, not only of the BDS movement, but of Reem’s Bakery. Obviously, I am not expecting you guys to leap from your chairs and run down to Fruitvale BART. I am just letting you know that there are still a few people who give a damn. StandWithUs did, in fact, stand with us. But where are the synagogues and other local pro-Jewish / pro-Israel organizations? And how is it that the city of Oakland does not seem to care one way or the other? I feel reasonably sure that if Reem’s was “Ariel Sharon’s Joint and Whiskey Bar” and featured a worshipful mural of Baruch Goldstein the people of Oakland would have arisen as one and shut that place down in a New York Minute with the full support of city government. As always, it is the blatant hypocrisy that is too much to take.